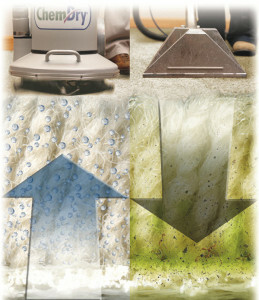 These factors explain why American Chem-Dry’s unique hot carbonating extraction system offers a deeper, faster drying, healthier carpet cleaning experience than typical steam cleaning services. American Chem-Dry’s process is different. We employ millions of microscopic bubbles to explode dirt from deep in your carpet fibers, which is why we only need to use a fraction of the water that typical steam cleaning uses. After the carbonation releases and lifts the dirt, our high powered equipment extracts the dirt and moisture from the carpet.